Just after the new year, I started looking at the cookbooks on my kitchen shelves. First, I have to preface this by saying that the kitchen I call my own is actually a big kitchen that is part of an old established academic institution here in Athens, Greece. It is my kitchen mostly, but we also use it for catering events – big and small – with a number of people involved in cooking. It has been this way for over a century and has seen numerous cooks come and go. Most of the cookbooks on the shelves do not belong to me, although I did bring quite a few with me when we first arrived nearly four years ago now. Mine were carefully chosen to reflect pan-Mediterranean cuisines (Italian, Moroccan, French, Spanish, Greek, Turkish, etc.) that would be best suited to the ingredients available here in Greece. To accommodate my books, I simply relegated the older books to higher shelves and left them there. 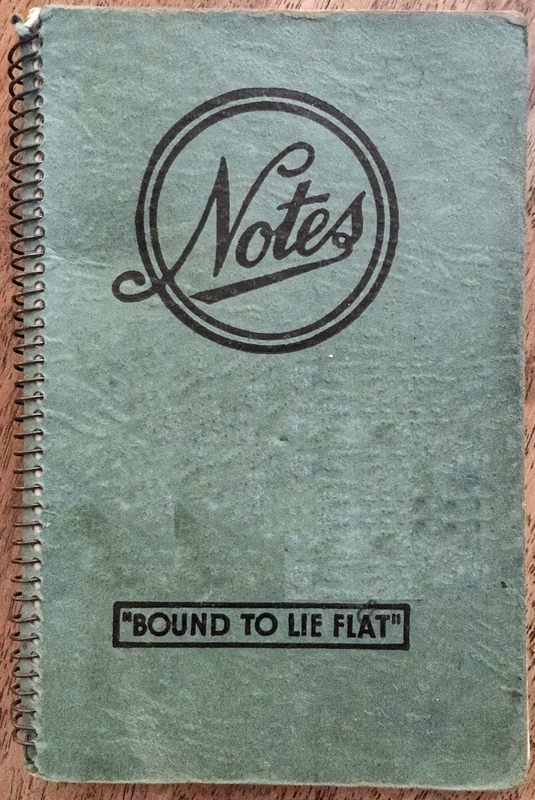 I really didn’t think much of them until this tiny spiral bound notebook with handwritten recipes was found sandwiched between two larger books. 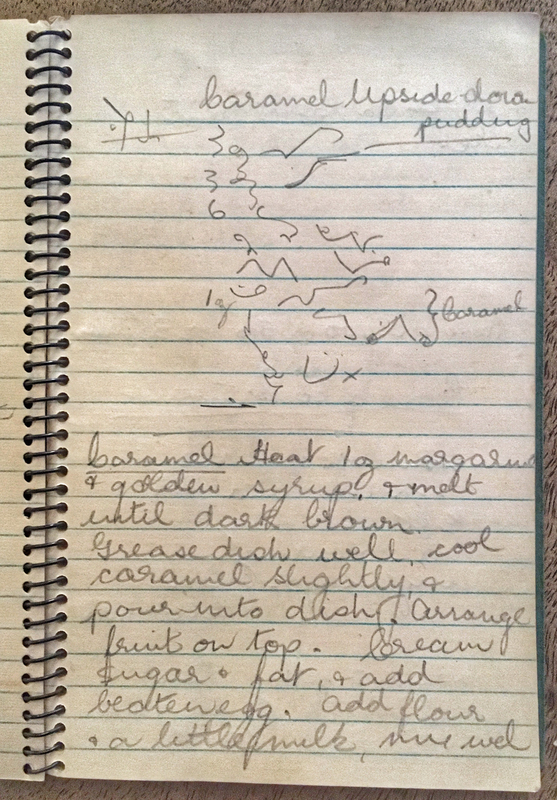 Conveniently many of the recipes in that notebook are marked with dates from autumn 1954 to spring 1955 and some ingredient lists are written in secretarial shorthand which look like squiggles. Most of the recipes are for sweets or baked goods: Simmel Cake, West Riding Raspberry Jam Tart, Chelsea Buns, Rhubarb Flan, Caramel Upside-Down Pudding… They are very English. It also struck me that many of ingredients would not have been available in 1950s Greece. In fact, rhubarb still isn’t available in the 2010s. And, most of the recipes reflect the mid-20th century era by their use of margarine rather than butter, and the use of non-metric measurements. That notebook made me inquisitive as to what else might be up there. I was surprised that I hadn’t looked before since I LIKE old cookbooks with all their quirks and tell-tale hints of past times. The oldest ones on the shelf dated to the 1950s, like the handwritten notebook. And, like the notebook, the content of these cookbooks is overwhelmingly baking related. 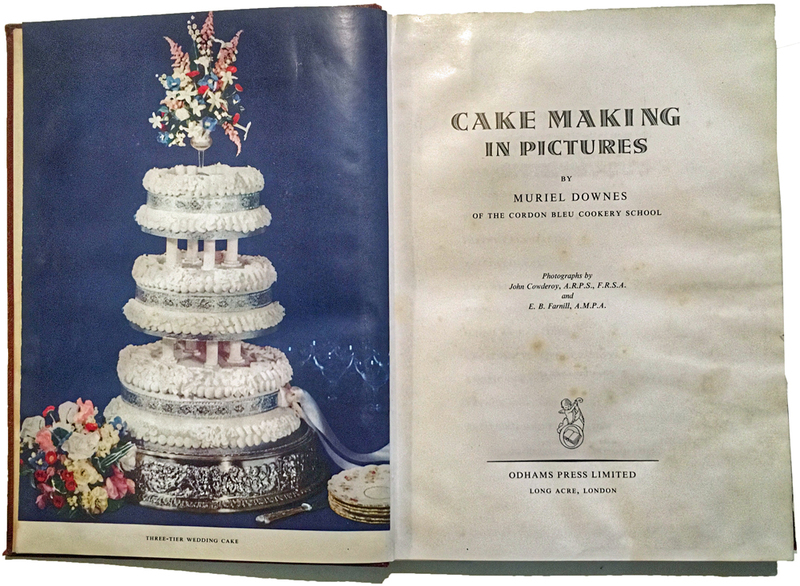 One of the books was a lovely picture book on cake making, published in 1957. 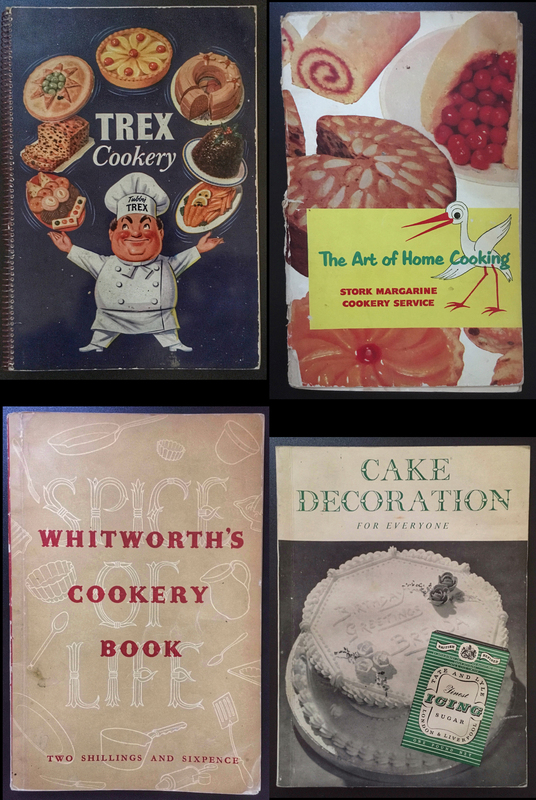 A number of the other mid-century books were pamphlets put out by companies – Trex (shortening), Stork (margarine), Whitworth (flour), Tate & Lyle (sugar). Only two of them list publication dates – Stork in 1954 and Trex in 1956 – but the artwork on all of them belongs to the decade of the 1950s. They stress baking and sweets, though these specific brands would not have been found on the Greek markets at the time. Even now I haven’t seen them on any Greek supermarket shelves. A few standard all-purpose cookbooks also graced the shelves. 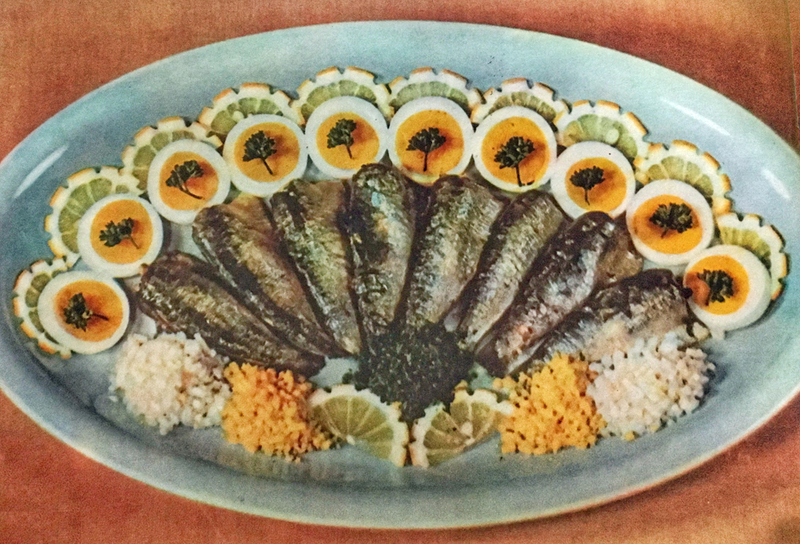 The oldest dates to 1953, a revised edition of Good Housekeeping’s Picture Cookery. It lives up to its title with numerous photographs of the food prepared – very retro food styling to the modern eye. Plus there were many colour advertisements for kitchen equipment and processed foods. It provides recipes for classic British dishes as well as foods typifying mid-20th century culinary trends: eggs mornay, vegetables in aspic, chicken vol-au-vent, pinwheel biscuits, sage and onion stuffing, Eccles cakes and vanilla slices, pork pies, cheese straws, steamed puddings, Yorkshire puddings, oatcakes, treacle scones, Garibaldi biscuits, marmalade, chutneys, mincemeat and the list could go on. It even has a chapter dedicated to cooking with the miracle fast-food pressure cooker that was all the rage in the 1950s. 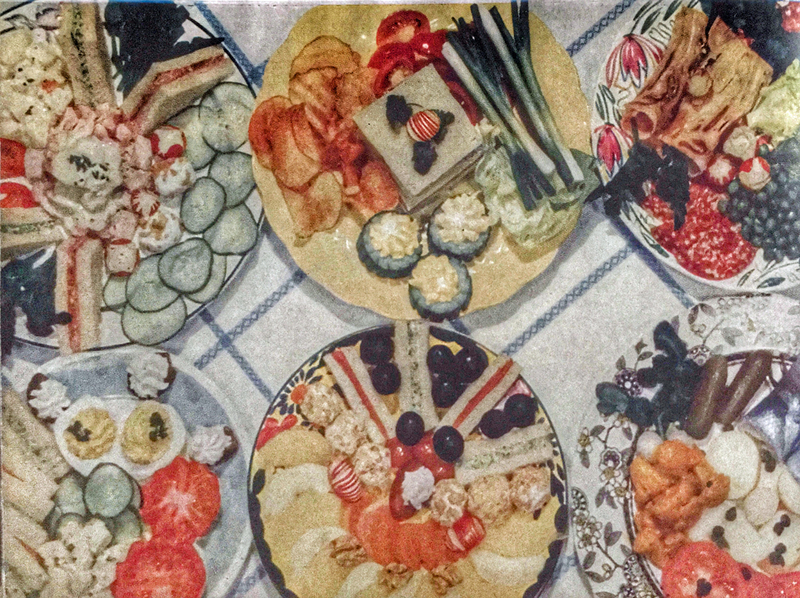 Retro food styling: salad platters. An advertisement from the book. The mixer looks similar to the vintage Kenwood mixer in the kitchen – a British machine originally since it has an adaptor for the British three-pronged plug. 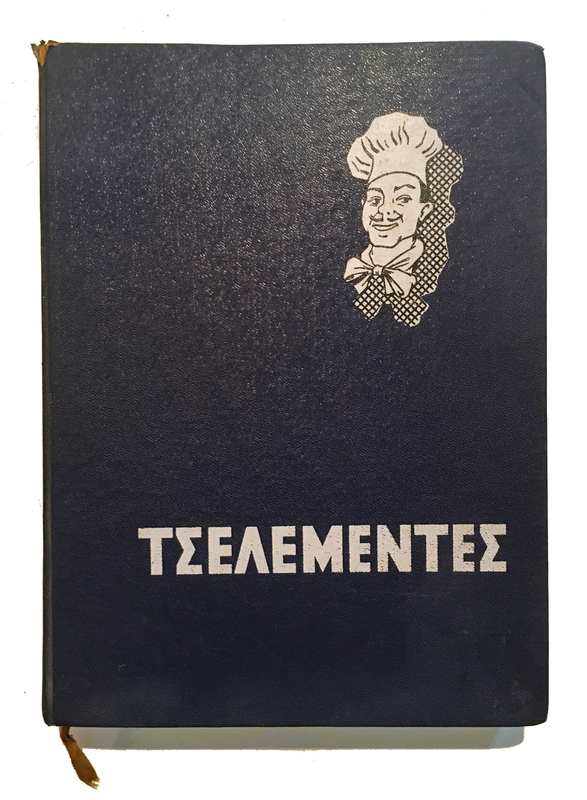 The earliest Greek cookbook on the shelf is a 1963 edition of O Neos Tselementés (The New Tselementes). If you look through this cookbook, there are many similarities in its basic recipes and those in the 1953 edition of the Good Housekeeping Picture Cookery. Even the food styling is similar. Except Tselementés was written in Greek, dealt with Greek ingredients such as aubergines that were not all that common in Britain at the time and included some typical Greek recipes such as vine wrapped dolmades. Nikólaos Tselementés was a Greek chef, noted for modernising Greek food, was heavily influenced by his early training in northern Europe. It is vastly different from the traditional Greek village cooking with more emphasis on butter and margarine than olive oil. Front cover with caricature of Nikólaos Tselementés. Both Greek and British books join the shelves after this. Many of the English language ones still assert the wonders of sweets and desserts. A past cook must have been greatly taken by Mary Berry’s sweets, baking and pastry, given the number of her books on the shelves. The clutch of books specialising in chocolate desserts hint that someone may have had an obsession with chocolate. 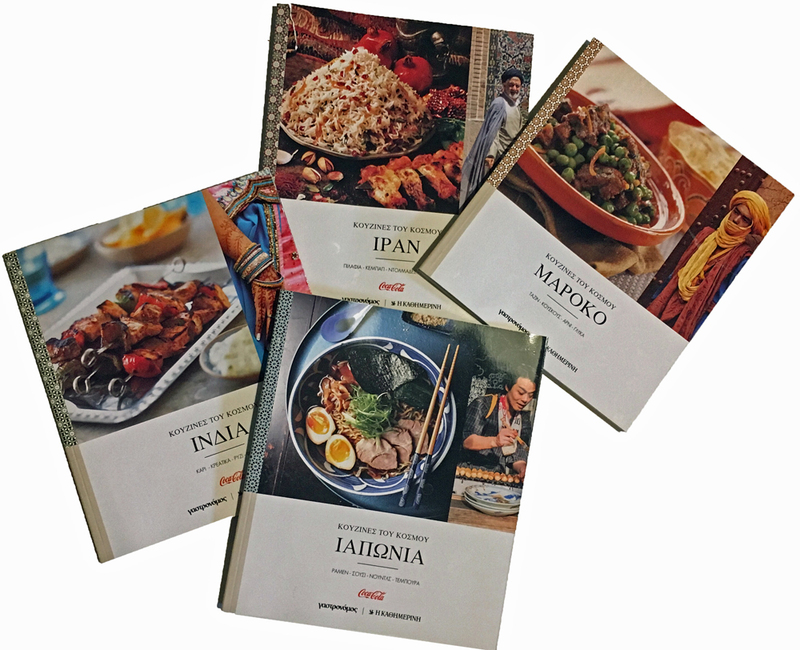 There is a Greek series that arrived more recently as free books with the Sunday newspaper on world cuisine, each volume detailing a specific country’s food (engineered for Greek ingredients and the Greek palate). I find it interesting that my books, The Glorious Foods of Greece by Diane Kochilas and two by Aglaia Kremezi (The Foods of the Greek Islands and Mediterranean Vegetarian Feasts), are the only books on the shelves that deal with traditional and regional foods of Greece. Our current cook keeps a notebook (in Greek) of her favourite recipes gleaned from magazines or those given to her by various people passing through. It is a multi-cultural collection. She has some of mine written in there, too – Paula Wolfert’s Moroccan squid tagine and Susan Loomis’s French Farmhouse baked apples. The most frequently used one is for spring rolls – suspiciously inauthentic Asian cuisine, but still tasty. They feature as finger food at many of our events. I’ve been meaning to write it down and this post gives me the perfect opportunity. We usually double the recipe, which makes a huge amount, but both the cooked filling and the rolled (pre-fried) product can be frozen for future use. Prepare your vegetables first. Clean, quarter and core the cabbage, discarding any limp outer leaves. Shred very finely. Do the same with the Chinese cabbage. Peel the carrots and coarsely grate. Top and tail the beans and cut finely on the diagonal. Chop the celery leaf. Chop your onion very finely. Put some olive oil in a large pot on medium heat and sautée the onions until translucent. Fold in the cabbages and the beans and let them cook for a little until they begin to reduce. Finally, add the carrots and the celery leaf; add salt and pepper to taste. Cook, stirring occasionally until the liquid that the vegetables have released has disappeared. Add the soy sauce and mix it in before turning off the heat. Sometimes, we use Worcestershire sauce instead of soy sauce, which our cook says has a better flavour. Stir in and then tip the entire mixture into a fine colander to drain. When cool, it can be frozen or used in making the spring rolls. Whisk an egg white and place in a bowl. Take your rice paper spring roll wraps and put them under a slightly damp tea cloth to keep them moist. Taking one wrap at a time, place a spoon of filling on the lower half, keeping a margin on either side. Fold the bottom over the filling, then fold in the sides and roll. Moisten the end with a little egg white to seal. If they are to be frozen at this time, place them seam side down in a single layer to freeze. Once frozen, they can be taken out and put in layers in containers. Fry directly from fresh, or defrosted from frozen. Put enough corn oil into a frying pan so that will come up the sides of the wrap. Fry on medium heat for about 5 minutes on one side, turn and fry another 5 minutes. Place on a tray of kitchen paper to drain. Serve with your favourite dipping sauce. Surprisingly, this turned out to be a slightly different IMK post this month! I love this post Debi. As a child of the 50s my Mum’s only bound cookbook was in illustrated Good Housekeeping. She had lots of other small publications that had quirky adverts for domestic products and processed foods. They have real curiosity value as a snapshot in social history. In my catering days, spring rolls were an evergreen favourite, I made them by the 100s. Small tip, it works really well to transfer them from the freezer straight to the fryer. I, too, am a child of the 50s and I remember these sorts of cookbooks at home. I just found it fascinating that they made their way to Greece – totally impractical recipes! Thanks for the tip about the spring rolls. Will pass on the info. A great post Debi. 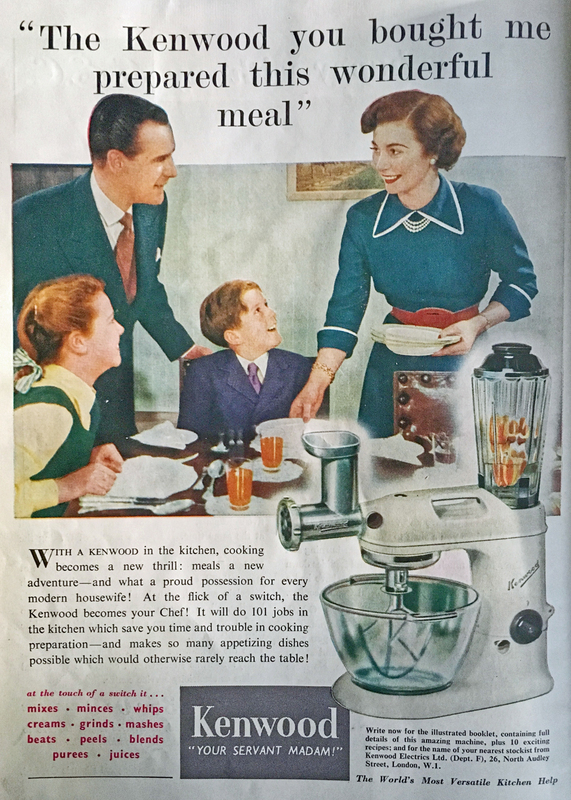 The retro pictures are interesting and the ad for the Kenwood, oh dear, hubby is such a good boy getting her that machine that did everything! the Greek retro fare has far more appeal. Veggie spring rolls are still a favourite here, so long as we wrap them in iceberg lettuce, with Vietnamese rau rum and mint, alla Vietnamese style, then dip into that sweet hot syrup sauce. Your thoughts on the Kenwood ad matched mine, exactly. I knew (intellectually) that Telemendes tried to update Greek food by emulating N European cooking, but was really quite clear the extent of his influence when examining these books. I’m afraid the spring rolls – as I posted them – are considered exotic enough. I don’t think I could get them to thing of using Vietnamese ingredients even if we could source them. I choose my battles and have got them to try Moroccan food with much success. Oh! We used to have – and use- that Stork book too, when I was a child. And the Trex book. Though we weren’t well off, my mother wouldn’t ever use margarine in cooking. We used to call it ‘sump oil’. I still do. I was astonished to find these on the shelf – so utterly British and impractical since many ingredients are just not available here. I had fun paging through them, though. P.S. My thoughts entirety on Margarine! It is fascinating, Ron. A field of study among anthropologists who find it useful to study culture through food. Hi Deb. Lucky you, all those old cook books. It is amazing how the most unlikely sounding recipe can sometimes turn out quite tasty. Your spring rolls sound strange but I bet they taste good. Old recipes tend to. That is how thet]y have survived. I agree, Glenda, I was surprised at what went into those spring rolls, but I assure you they are tasty. I expect they are a nice change from Greek food.